In the state of California, there are a few different ways to settle an estate. The one that will be right for your family’s needs depends on the value of the deceased person’s estate, and whether or not some assets don’t need to go through probate at all. Here’s what you need to know about the probate process in California. Regardless of whether the estate will need to go through probate, if you’re the executor of someone’s will in California, you’ll need to file it with the local superior court. The court will determine whether or not the will is valid if probate court is deemed necessary for the settlement of the estate. If you want to avoid putting assets through probate, you can use estate planning to establish living trusts, POD bank accounts, and joint tenancies to pass assets to heirs immediately after your death. Generally, summary administration is a simplified probate process that can be used in California if the value does not exceed $150,000 and 40 days have elapsed since the decedent’s death. Keep in mind that there are separate summary probate procedures for small estates, such as (1) for personal property under $150,00 in value; (2) real property under $50,000 in value; (3) real property under $150,000 in value; and (4) transferring spousal property. The executor begins this probate process by filing a Petition for Summary Administration, which must be signed and verified by the deceased’s surviving spouse, if there is one. If any of the deceased’s beneficiaries doesn’t sign the petition, you’ll need to formally serve that person with notice of the filing of the petition. The petition should list the deceased’s assets and the value of those assets, as well as stating who inherits each one. It should also state that the estate qualifies for summary administration. The court won’t appoint an administrator or executor for the estate. It will simply issue an order releasing the property to the heirs. Heirs can use copies of this order to obtain ownership of assets, such as funds in a bank account, for example. Formal administration, or formal probate, is a process that’s used when the estate doesn’t qualify for simplified probate. The executor begins this probate process by requesting to be appointed personal representative of the estate by the local superior court. Formal probate proceedings take place in the county where the deceased person was living at the time he or she died. Beneficiaries are given notice of the probate proceedings, so they can object if they want. The court will issue Letters of Administration, which grant the executor, or personal representative, the authority to settle the estate. A will, if it exists, must be filed with the court and proven valid, by having witnesses to the will testify under oath as to its validity. However, this process won’t be necessary if the will is self-proving. In California, a will is self-proving if the witnesses watched the will-maker sign the will and then signed a statement in front of a notary public. The court will supervise the personal representative to inventory the deceased’s assets, pay his or her taxes and debts, and distribute what remains to the heirs. Once this process has been completed, the personal representative must submit to the court a final accounting of the estate’s contents, how they were managed, and the plan for distributing them to heirs. Heirs can object to this accounting in court. Once the estate has been distributed to the heirs, the personal representative files receipts with the court and requests that the estate be closed. Once the court has closed the estate, the personal representative will be absolved of further responsibility in regards to the estate. This process can take up to eight months to two years. 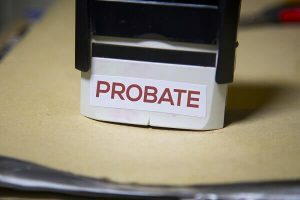 If you’re the beneficiary of a deceased California resident, you might need help navigating the probate process, especially if the deceased left behind a large estate. A probate attorney at the Ledbetter Law Firm, APC can help you tie up your loved one’s loose ends, distribute his or her assets according to the will, and close his or her estate in a timely fashion. Contact The Ledbetter Law Firm, APC by filling out our online contact form, or call us at 310-507-7022 to discuss your estate planning needs and any questions you might have about trusts, wills, or the probate process.